Until now there has been no single, comprehensive resource on the status of North America's most threatened birds and what people can do to help protect them. Birder's Conservation Handbook is the only book of its kind, written specifically to help birders and researchers understand the threats while providing actions to protect birds and their habitats. Jeffrey Wells has distilled vast amounts of essential information into a single easy-to-use volume-required reading for anyone who loves birds and wants to ensure they are protected. At-a-glance species accounts cover in detail North America's one hundred most at-risk birds; each account is beautifully illustrated by today's top bird artists. The text includes status, distribution, ecology, threats, conservation actions and needs, and references. A distribution map accompanies each entry. Chapters discuss birds as indicators of environmental health, the state of North American bird populations, major conservation issues, and initiatives now underway to improve the health of North America's birds. Birder's Conservation Handbook is an indispensable resource for birdwatchers, researchers, naturalists, and conservationists. 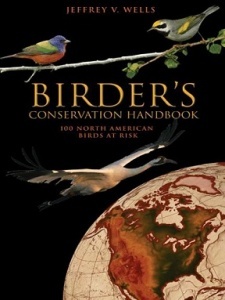 Reading it will inspire you to become an active steward of our birds and the habitats we share. 'A considerable amount of information about the perils facing some of our feathered friends, including the emperor goose, yellow-billed loon and rusty blackbird. Some may say conservation is for the birds, but would the world really be a better place without the elegance of the trumpeter swan?' - John Mark Eberhart, Kansas City Star.